is now available online, and in bookstores everywhere! And oh boy, I think you’re going to like it. This book shares the 25 most powerful productivity tactics I’ve ever encountered—boiled down from the hundreds I’ve experimented with over the last decade—and weaves these together with stories from my (admittedly pretty weird) productivity experiments, as well as interviews with the most renowned productivity experts from around the world, from David Allen to Charles Duhigg. The value packed in these 304 pages is incredible. Consuming caffeine strategically, not habitually. Scheduling less time for important tasks. Slowing down to work more deliberately. Shrinking and eliminating the unimportant. The 20 second rule to distract yourself from the inevitable distractions. The idea of productive procrastination. I wrote this book to be as helpful and entertaining as possible, and I’m confident you’ll find it just that. Productivity is how well you manage your time, attention, and energy. The Productivity Project reveals the absolute best ways to manage all three. 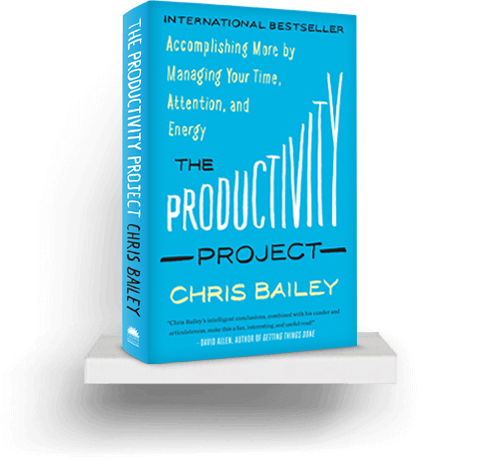 The Productivity Project is also available as an audiobook (US/Canada; International), and in Complex Mandarin and Korean translations. It is currently being translated into Simplified Mandarin, Japanese, Russian, Portuguese, Thai, and Polish. A Life of Productivity is free from advertisements, sponsorships, and copyright. Click here for more. Chris Baragar is. Page illustrations by Sinisa Sumina. Code by Ryan Wilfong.